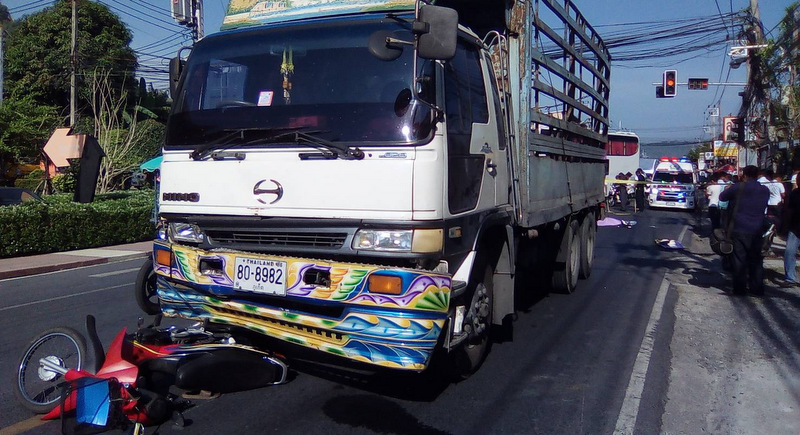 PHUKET: A 64-year-old woman driving a motorbike with her 11-year-old granddaughter as passenger died this morning (Mar 20) when her head was crushed under a 10-wheeled truck in rush-hour traffic in Rassada, north of Phuket Town. 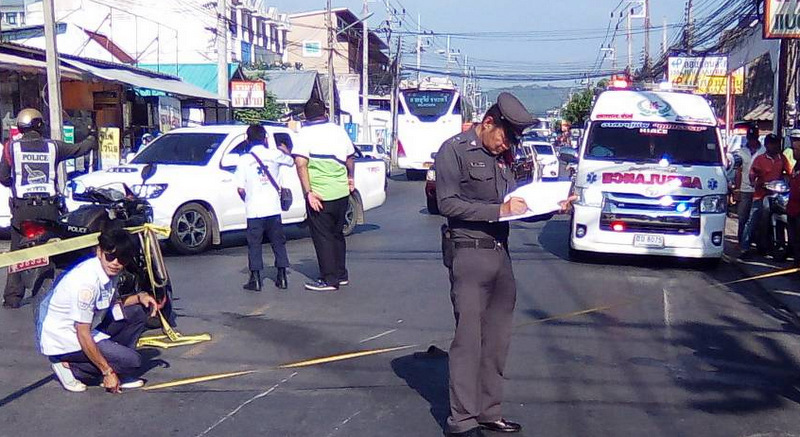 Lt Sunan Petchnoo of the Phuket City Police was notified of the accident, near the intersection of Ruam Pattana Rd and Ratsadanusorn Rd, at 8:30am. Kusoldharm rescue workers along with Mission Hospital Phuket medical staff soon arrived at the scene. The 11-year-old girl, Samawan Kraisart, who is a Pratom 6 student of Piboon Sawasdee School, escaped the impact with only minor injuries and was taken to Vachira Phuket Hospital in Phuket Town. Her grandmother, Noonoi Kraisart, 64, was dead at the scene from head trauma after her head had been crushed under the wheels of the truck. Fifteen metres away from Ms Noonoi’s body was a 10-wheeled truck with “Thepkrasattri Khong Gao” (Thepkrasattri old items) emblazoned on the side and a motorbike still pinned under the front bumper. “Ms Noonoi was driving the motorbike with her granddaughter Samawan from a house in Soi Maekam to Piboon Sawasdee School, which is three kilometres away from the house,” Lt Sunan said. “She had turned left from Soi Maekam (onto Ratsadanusorn Rd) and slowed down to cross the road to turn right into Ruam Pattana Rd,” he explained. “Witnesses told us that the truck was moving at a high speed**. The truck hit the back of the motorbike. Ms Noonoi went under the wheels while the girl Samawan bounced off the truck, Lt Sunan added. 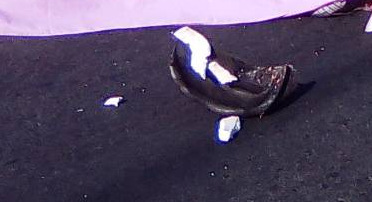 “The truck dragged the motorbike 15 metres from the impact point,” he said. 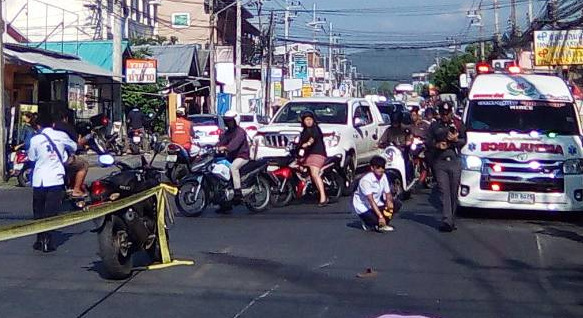 Witnesses told The Phuket News that young Samawan was overcome with grief at the scene, hugging her dead grandmother’s body and refusing to be taken to hospital. “The truck driver was not found at the scene. Instead, he immediately presented himself at Phuket City Police Station,” Lt Sunan noted. “We are continuing our investigation and checking CCTV nearby,” he added. ** UPDATE: CCTV footage of the accident later revealed that the truck was not speeding, and that Ms Noonoi had crossed in front of the truck in order to make her right turn. Sorry but the lady had a death wish. She pulled straight across the front of the truck, which did not appear to be speeding. You see it all the time with the small motorbike drivers who think they own the road. Why would he flee the scene then? Not to mention he dragged her some distance... Hmm must be the only GOOD truck driver in Phuket, still doesn't change the fact overwhelming majority are maniacs! The whole article is BS and so it leads to those comments accusing the truck driver wrongfully.I saw the video on PG,clearly the deceased woman was at fault.Cutting in front of the truck,who by the way wasn't speeding at all. It all comes to the factor speed and driving by not smart people. Busses, Lorries, cement/water/cargo trucks should have a speed limiter, set on 70 kmh. Is it not clear enough that you can not let irresponsibly people just drive any speed they want, while sometimes being busy with their phone or seeking a water bottle in the cabin? Remember that truck accident in underpass a few days ago? The reckless driver will get a minimum fine or jail time. Nothing will be done or changed. Why? It takes a lot of man hours, paperwork, and traffic enforcement to improve road conditions. It's easier to allow the carnage than to clean it up. Pretty clear case going by of just another idiotic, reckless, Thai truck driver, they are all over Phuket, their stupidity is dumbfounding & typical cowards fleeing the scene, gutless wonders. I feel very sorry for the little girl left traumatised by this lunatic driver, lock him up and throw away the key, when will they ever learn.